I don't know about anyone else, but I spent the first 50 years of my life apologizing for who I was and trying to fit into a box that I thought was what was expected of me. I tended to shrink myself down to try to be small and acceptable - I wasn't game to show my true colours because they were too bright and too discordant and might cause offence. What a waste! What an absolute waste! Such a shame to have dimmed my light and to have crushed my aura (to quote a friend from long ago - I love that word picture). How many of us have lived lives that were "less" because we were too afraid to be "more". We were polite and we bottled it up, and sucked it in, and tucked it away - but how amazing would it have been to have been brave enough to embrace our uniqueness and not to have been so careful? The many, many times I've said "sorry" - sorry for being too loud, sorry for being unladylike, sorry for not being sweet enough, or quiet enough, or gentle enough, or whatever enough. All those years of apologizing for who I was and trying to turn that girl/woman into someone I wasn't. I'm not sure why I thought I needed to make myself less but it was certainly ingrained deeply into my self worth. My husband didn't fall in love with me because I was a mouse, he fell in love with the independent young woman who'd left home at 19 and made her place in the world. He saw in me a confidence that I certainly didn't know I possessed. He was okay with me not being a textbook little wife. But regardless, I still struggled to be that ideal Proverbs 31 woman - ridiculous and so not "me" - but she was supposedly the pinnacle of womanhood. It took me until my 50's to realize that perfection is a myth and not something to be relentlessly aiming for. It's perfectly okay to not be perfectly okay! I felt an incessant need to make myself small - I'm tall and I'm loud(ish) but that's not really desirable in a woman - we're supposed to be small and delicate and graceful and quiet. We're supposed to know how to blend in and not to be too obtrusive. We aren't supposed to laugh at inappropriate things, or know too much, or talk too much. We are supposed to fit into a neat box that's tied with a pretty bow. I know that sounds ridiculous in today's day and age, but I'm sure there's plenty of Midlife women out there who've struggled with similar issues and had boxes they tried to squeeze themselves into so they fitted the perceived "norm". I'm sure most of us have a story from our younger days where we made ourselves "less" so we didn't tread on someone else's toes. 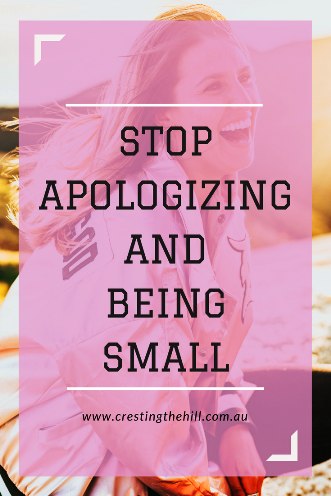 What I LOVE about Midlife is that I can toss most of the smallness and the apologizing out the window. I can accept myself for who I am and own that. I can have an opinion and a voice and own that and not worry if it's alright to speak up. I can choose how I wear my hair, what outfits I like, whether I have piercings or tattoos, what colours I want to shine with. I can be ME and I don't have to say sorry for it or dim my light. It's difficult to adjust to that at times - to not second guess myself if I like something that might not necessarily fit in that neat little box. I have to be brave enough to take ownership of my choices and to realize that nobody is judging me - or if they are, that's their issue, not mine. I can live as largely as I like and I can celebrate the freedom that comes with lifting the lid and stepping out of that box and spreading my wings. It's a darn shame that it it took me 50 years to stop aplogizing and being small - but I still have (hopefully) another 50 years to come - where I can live large, where I can be my best self, where I can embrace who I am, and share my real self with those who love me, and I can finally let my light shine. Are you living larger in Midlife? Are you able to own your choices and ignore the critics? Were you fortunate enough never to have had to fit into a box? Or are you like me and lifting the lid and stepping out into a fresh new world? I am so like you in lifting the lid and stepping out! It also took me 50 some odd years also! Blaming it on the blessing of my mid-life hormones! I also, am tall,... at 5ft. 10 inches....and can belt out a good laugh when something is gut retching funny! Someone close to me when I was very young, told me to walk at not such a big pace....and that I had a stage voice (nice way of saying I spoke loudly) and how I should learn to speak quieter if I wanted to be a real lady in life. Well, I've suffocated starting with this advice along with other bits and pieces of crap advice from people....trying to perform small so's to gain admiration! A few years ago, I started to gain more confidence to sift slowly and wisely through all these lists of adgendas I allowed others to place on me,,,and slowly I'm re-programing to bring out a more original me! Your article hit the spot today! "You Are Not Required To Set Yourself On Fire To Keep Other People Warm!" however, it spoke to me along the lines you mentioned today! Thanks Amy - I totally feel on the same page with what you're saying - the amount of well intentioned advice that just served to squash us into something so much less! I love that Midlife is giving me the confidence to tell myself that I don't have to listen to those voices anymore - I can just be who I am in all my messiness and those who love me will accept that - those who struggle with it are probably not my people and that's okay too. Wow Leanne, I can FEEL your inner on this one!! Sadly I think nobody is immune from the legacy of the wounding of our younger years. But we are, each one of us, fearfully and wonderfully made - "unique" as you say - and each hair on each head is numbered. What a lovely thought! Loved just as we are. I thought you might like this modern-day take on the Proverbs 31 woman, it definitely gave me a smile. It was certainly a fun take on that indomitable woman who has been the paragon of all things Christian women are supposed to aspire to Sue. I have always found her a bit much to tell the truth and that version gives women a little more grace because when it comes down to it, we're all doing our best to be our best selves aren't we? Leanne, I can hear the passion in your voice here. While I've actually been small and quiet most of my life because I'm 5'2" and introverted, I can relate to the feeling of wanting to be me and not something others tell me I should be. I've worried that if I'm too much different, I'll lose friends (and my spouse). I've tried to voice my own opinion on things and then gotten verbally smacked down by others. (one just happened today). I'm not sure how to avoid the critics. I'm glad I can look towards others like you as role models on being their true selves. It's interesting Pat that for every woman who has been told to be smaller, there are probably equal numbers who have been ignored or overlooked because they were small and not brave enough to live any larger. I really want Midlife to be the time when we all stand up and claim our true selves - loud or quiet - but valuable all the same! It would be such a waste to live the next few decades as a shadow of who we're meant to be wouldn't it? I know this feeling well Leanne. My early married life was always trying to be the good little wife, while it wasn’t until my late 60’s that the worm turned and I started to say what I thought instead of keeping it it bottled up. Friends would comment that I was a different person when I was out without my husband. It was then that I could say what I liked without being corrected and pulled into line. Thanks Mum - it's interesting that you look back and can see that there was more that you could have been if you'd been encouraged to bloom instead of being told to conform. We've missed out on being all we could be when we were younger, but I'm so glad there is time left to be all that we have the potential to become. It's nice to live life unafraid of the opinions of others - that's my aim and although I still slip backwards at times, I'm getting there and we'll have a blast in the process won't we? Awesome post, Leanne. There are so many different ways that we apologize for who we are. I straightened my naturally curly hair every day from when I was 11 until I was 50. Now I have no idea why I did that (or where I found the time)! I agree that taking ownership of who we are, and the choices that we make takes much bravery. I also agree that when we take this ownership, we wonder why we didn't do it (much) sooner! While you were straightening your hair I was busy getting perms for years Donna - the hoops we jump through are ridiculous aren't they? I really like that now I do something, or wear something, it's because I want to - rather than because I thought it would make me fit in more or make me more acceptable. This is intriguing. I find myself apologizing more now, as a product of being married and sharing space with someone else, usually. When I was a teen, I had already lived in multiple countries, and I was angry with the school my parents were sending me to, and I was vocal about everything. I showed my true colors and just let the chip on my shoulder keep away anyone who couldn't take it. When I got older - probably a transition during college - I realized that sharing every thought in my head was not a great way to win people over, but I never apologized for my outlandish, foreign-sounding thoughts. I simply kept my thoughts to myself and ignored the idiots. I kept myself small for years, to spare triggering my husbands' (yeah, both of them) insecurities. Neither of them were strong enough men to deal with an independent woman - they wanted to enjoy the career woman's income but not the rest that came with it, I found out too late. Well, that's behind me now and the Widow Badass is living large and loving it. Thanks for this post, Leanne. That's why I love your title so much Deb - the fact that you've been through the process of finding your voice really encourages me because it's a journey a lot of us have been through for various reasons - mine was from my father I think, and your's from your husbands - nice to know they couldn't keep us down! I think a lot of Aussies do too Diane (not the yobbo ones who give us a bad name - but the rest of us) I'm really tired of saying sorry though. After being on my own for 20 yrs after my first divorce I knew my now husband was only going to get the real me. After leaving my first marriage and finding my feet on my own I was never going back. Now I am what you see is what you get and I don't hold back the real me. Having to stand on your own two feet for so long would definitely have impacted on your ability to speak up for yourself Victoria. There were a lot of times when I stepped back and now I'm happy to stand my own ground or even step forward because time is a-wasting! So much in common with your descriptions, Leanne. It does feel like years wasted sometimes, I tell myself that all of that helped form who I am and taught me to build the courage to break out and become who I really want to be now, there is still time. I do appreciate and practice the social graces, but I fully intend to be ME and express my thoughts and personality in a way that is comfortable for me and respectful to others without feeling stifled or overbearing at the same time. We become a product of our environment when we are young. I was raised in traditional "proper" ways which I appreciate, but then add on the teachings of the "deep south" from our southern United States that holds lots of "rules", Lord have mercy, ha! There is a lot of "do as I say, not as I do" still going on here. Sometimes hubby thinks he has to brief me on what not to say and how to act at his family's gatherings, and I have to set him straight in a firm and colorful manner. LOL. Thanks, Leanne, your post is important and I think a lot of us can relate to it. I think there are elements of that within church society in Australia Lori Jo - so many little rules and expectations of what a "good Christian woman" should look and behave like. I'm so tired of it all and I'm not prepared to bite my tongue any more. I'm willing to take the fallout if I overstep because we've been made by God and to be authentic to the woman he created, we need to use our voices and our uniqueness - no more cookie cutter Christianity for me - and don't get me started on the Proverbs 31 woman! I like the idea of being human rather than being pushed into a little girl box Sandra. The people pleasing is something that women seem to have particularly got caught up in and it is so detrimental to owning our own opinions and personality and style. I'm happy to claim my space in the world now and to admit that I'm a work in progress - but my own person and not someone's version of who I should be. Fortunately my long suffering husband is okay with me spreading my wings - otherwise he'd be long gone by now! It is amazing (and a little sad) that this speaks to so many of us. Sigh. I am afraid my daughters are no living smaller than they should be. And what do you do if you husband enjoys that quiet little woman? If he doesn't support you being yourself? It's a dilemma isn't it Leah - when we sell ourselves as something when we're young and then realize that our true self is something altogether different. Hopefully you'll find ways to live a little larger without treading on your husband too much in the process. I think they should be proud to have a wife who is becoming more but it can probably feel a bit threatening too. Good luck! Oh, Leanne, I love this post. So very true! There is so much messaging in our society that encourages women to be small and quiet, and generally take up less real estate in the world. I think that is so damaging. I was in my mid-40's before I realized just how much these messages had shaped my life. It feels good to have opinions, laugh out loud, love ourselves and just generally let our energy rip. You said it perfectly Kristin - "let our energy rip" is such a great picture because we've bottled it up for too long and that's been such a waste. I want to spend the time I have left on this planet being the best possible version of me - and that means colouring outside the lines and living large - it's exciting and scary owning ourselves and taking the fallout that comes with it - but so much better than squashing ourselves and silently stewing when we have something worthwhile to contribute. Leanne - you've hit a nerve with this post with so many! I found my voice in my early 30s when I left the convent -- and part of my purpose in writing now is to encourage other women to find their own. I'm so glad you've found yours and are sharing it with other midlife women! Thanks for another great post! I loved reading this post, Leanne, and all of the comments. I don't often read each comment (because of time constraints), but these drew me in. I was the tallest girl in the class (at 5' 8") and one of the most quiet. I felt I should be more outgoing and make more small talk, but I was afraid of saying something "stupid." I'm still not much for small talk, though I love listening in. I will jump in to the conversation when I have something to say, but I no longer feel the "need" to say something--the nagging inner voice saying "I should be talking too" has been silenced. I still sometimes worry about embarrassing myself or upsetting someone, but those times are getting fewer and further between. I definitely feel as if I'm coming into my own in midlife, and I love it! Thanks for another thought-provoking post! I was the same - 5'8" in high school - tall and skinny and not very confident. I wish I could tell that young woman to hold her head high and to see all that she had to offer - instead of ducking and slouching and underestimating myself. 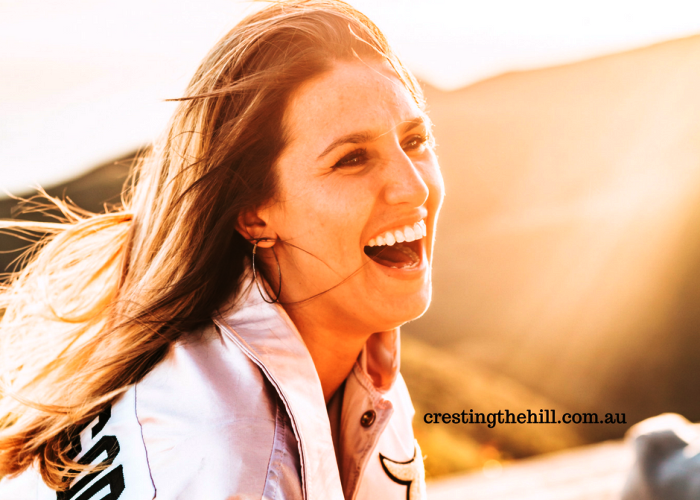 I'm still not the shining light of a party, but I know what I value and what I want to shine at - that's what I focus on now and I love that I'm brave enough to own that - we're going to rock the next few decades Christie! YES, YES, YES!! Perfect words! Thanks so much Trisha - I saw it on your FB page and left a comment - I really hope that other women read it and join us as we discover the woman who's now out of that box! As a Canadian, it is a bit of a national joke that we apologize for everything... but, on a personal note, like so many others here, who I was when I was younger just didn't seem to measure up in so many ways for so many people. I started coming into my own after I had children, and now that I am "of a certain age" I have finally reached the stage of "this is who I am. If it doesn't work for you that's is about you, not me, so feel free to move on". I have friends and family who still love me so I think I'm ok! 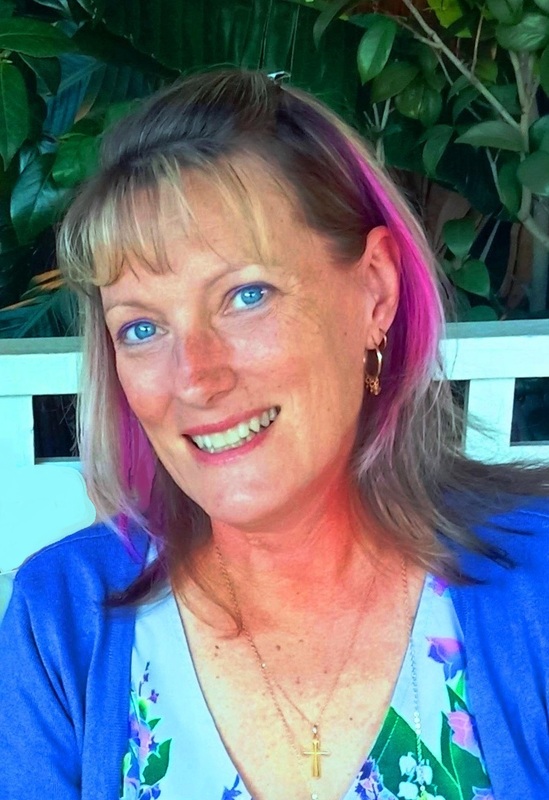 Great article, Leanne - sharing for sure! We might have different personalities Min, but I think our hearts are the same. I'm so glad that my daughter has the confidence that I missed out on at her age. I'd like to think my parenting helped a bit, and it's a shame we didn't have that headstart in our 20's onwards. 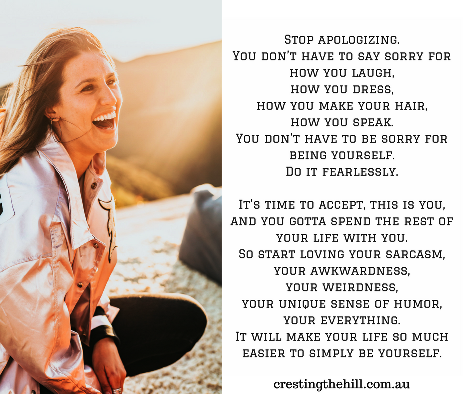 Luckily it's not too late and I think as we embrace our quirks we become so much more - and that's a really engaging part of this Midlife journey. Congrats on living large and be yourself, Leanne. It's freeing and never too late. I found my voice early, started living on my own after I graduated from university, and have been able to live my life pretty much how I like to. Leanne, as you can see from the comments there are many of us who feel exactly like you. It is sad that we feel we wasted so much of our life feeling this way but we can certainly make up for it. Another problem, is that we see ourselves so differently to the way others see us. As you said, your husband fell in love with the beautiful, independent woman you were and you probably didn't see those qualities in yourself. Here's to standing up and being proud in the spotlight of Midlife, rather than apologizing and hiding the the background. You're so right about our self-perception Sue - I think others can see elements within us that we miss because we lack that little spark of self-confidence. Now that I'm not trying to be all that I think others expect me to be, I've been able to step back and find what is important to me and to own that. It may not be as exciting as the lives others are leading, but it's a comfortable and interesting life for me and that is so important to being relaxed and happy. And yes - here's to another great #MSLTL party! My father was completely dismissive of what I brought to the table Denyse and I often wonder where I could have ended up if he'd encouraged me to pursue all I was capable of being. I also wonder how many women could have made bigger and more valuable contributions to our world if their men folk had cheered them on rather than considering them less worthy? Great post! There are so many lessons in life we learn way too late! You're right Amy - but my consolation is that there are still decades to go (God willing) and I intend to make the most of them! I'd love to see you write your memoir Brenda - and to see the contrasts in the before, after and then the "now". I think a lot of Christian women really struggle with that concept of being "good" and being quiet and submissive and knowing their place - I know it's been a battle for me at times coming from a secular background and marrying into a staunch Baptist family - very loving, but very conventional. It can be stifling at times and it's taken me a long time to say that I love them, but I'm not quite the perfect fit for that life. I think they understand that now and they allow me my quirks - but I wonder how different life might have been if I'd had parents that pushed me to be my best, in-laws that weren't quite so religious, and the courage to be all I had the potential to be? I think we need books like the one you could write to show us the way, and I keep reminding myself that it's not too late, a slow start is better than no start and I want to find out who I really am and to see where that person wants to go. I'm afraid it took me slightly longer than 50 years to learn this valuable lesson (and truth is... I'm still learning) but you are absolutely right. NO MORE! I am pinning your poem in the hopes of reading aloud for daily positive affirmation. It's amazing because we've had to work on getting my mom to stop saying "I'm sorry" all the time. And since the nut doesn't fall far from the tree, it wasn't that long ago that I had to work on that. It does seem like a waste for the years that we did it, yet I hate to think some of my life was wasted. It was different. And I've learned a lot. Which is why I'm SO glad I'm older and at the stage I'm at!! I feel the same way Jodie - it wasn't wasted, but what could we have become if we'd had the underlying foundation that taught us to be all we're capable of being? I wonder what career I'd have chosen if I'd been given free range? As for saying "sorry" it was my punctutation mark for decades - not so much now! It is a shame to come to this realization in your midlife, not that it's too late. But I do have regrets about being raised by parents who thought my most important role in life was to be a wife and nothing else. And they didn't instill a bit of adventure in me -- I grew up to be afraid of almost everything and anything new. How we Boomers come to fear taking risks! At least I did and still do. Just a bit of encouragement would have gone a long way. At this age, though, I do meet more and more women who are breaking free and going their own way. I'm big on saying sorry too Debbie - it's definitely a "woman thing" and it annoys my husband because he worked with a woman who said sorry and then went ahead and caused a lot of grief on a regular basis. So I try not to use it unnecessarily too - it dilutes its meaning if we over-use it. Leanne I find your post very interesting and it definitely hits home for me. We were raised that kids were seen and not heard. And be a good little girl. Girls shouldn't behave like that. I grew up very introverted and shy. I was a very small child and everyone including teachers made fun of me and called me mouse. I carried this into my adult life and always thought I wasn't good enough. So I tried to be the perfect wife when I got married. I failed miserably and didn't measure up to my husband's expectations. Fast forward many years and more failed relationships. I decided I needed to work on myself to get rid of these negative words that kept ringing in my head that I was not good enough. I became very independent and focused and I started to like me and the woman I was becoming through researching and discovering I was good enough! So sad it took me so long but that was my journey that was laid out for me. I am happy who I am today and I am successful and happy. Love this post Leanne. Thank you. I can truly feel what you've been through growing up - why are we squashed so much as girls and young women? I'm not sure that boys have this to the degree that we experience - maybe they're made to feel that they have to be bigger than they really are (rather than smaller like us?) Stereotyping and compartmentalizing people is so stifling and it's such a shame that it takes us so many decades before we escape it. I'm so glad you're finding your way out and spreading your wings and living large - I'm hoping it's something that every Midlife woman lays claim to and has the satisfaction of seeing herself bloom. I drive my husband crazy, he says I always underestimate myself and give the wrong impression. I am learning, must be a slow learner but it is ingrained. Leanne I have learned so much from you and some other bloggers on being myself and not saying sorry when there is not need to. Thank you. Hi Kathleen - it's funny that you should say that because I have always seen you as really confident, on top of your game and still managing to stay nice in the process! It's strange how we manage to project confidence when we still have that little child inside who is too scared to speak up. Maybe we're all learning to be braver in Midlife - that's got to be a good thing doesn't it?